Jenna Hauck/ The Progress David Voth leads the junior and intermediate members of the Chilliwack Youth Orchestra through rehearsal. A group of Chilliwack’s youngest musicians is gearing up for its annual December concert, and this year the event will benefit Ruth and Naomi’s Mission. The Chilliwack Youth Orchestra (CYO), a fairly new symphony orchestra for grade school kids, will present its Christmas Benefit Concert on Dec. 9. This is the fourth season for the CYO and conductors Johan Louwersheimer and David Voth are impressed by the young talent and pleased with the symphony’s success so far. “We get these kids out of their shell. That’s what it’s all about — getting that opportunity to do something where they can feel like they’re at home,” says Louwersheimer, artistic director for the senior group. For many years Louwersheimer had wanted to start a youth orchestra here in Chilliwack so kids wouldn’t have to travel west to the Vancouver Youth Symphony Orchestra. In 2014, that vision came true. “People think they have to go to Vancouver to get high quality stuff — you don’t,” says Voth. Currently, the 36-member CYO is made up entirely of strings, but all orchestral instruments are welcome. People may wonder why strings are the most popular instruments for kids to start playing. It’s the size. 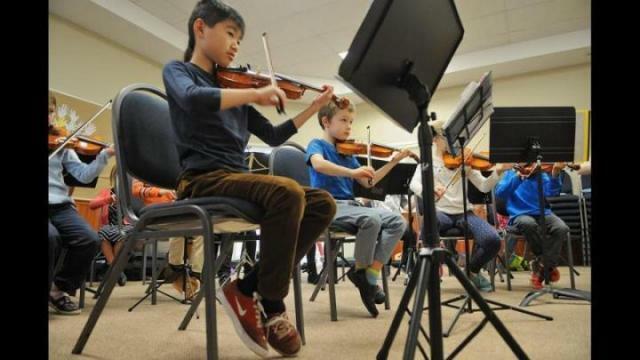 You can’t find kid-sized trumpets, but you can find kid-sized violins, so youth playing strings are often further along than those playing wind or brass instruments. They’ve had kids from Hope, Agassiz and Abbotsford join in the past. The young musicians do audition, but “it’s very low pressure — it’s more placement. We don’t reject people,” says Voth. It’s challenging to have music that the juniors, intermediates and seniors can all play together, since it’s three different levels of talent, so the Dec. 9 concert will be divided into two performances: the first half featuring the juniors and intermediates, the second the senior symphony orchestra. All of the CYO members take lessons on their own time outside of CYO rehearsals. Voth teaches many of them personally. “I get to see them in their lessons, and I get to see the excitement that they have, and I get to push them a little bit harder too,” says Voth. They both agree that it’s a “good little orchestra” adding that they won gold at the Chilliwack Lions Club Music and Dance Festival in February. Additionally, the CYO provides leadership roles to kids by allowing and encouraging them to be on the board of directors. Often the older teens act as mentors for the younger kids as they help them during rehearsal, too. They also have a development camp at Camp Charis in November where kids not only learn music skills, but also have the weekend to socialize with each other outside of rehearsal time. And in March every year, the CYO spends one day travelling to three different elementary and middle schools to perform. The CYO rehearses every Saturday morning at Broadway Church from 10 a.m. to 12:15 p.m. (each of the three groups rehearses at a different time). Their season runs September to June each year, though kids can join at any time throughout the year. Annual fees are $190 (juniors), $230 (intermediates), and $300 (seniors), plus a $50 fundraising fee. Those joining later in the season may qualify for a discounted rate. There are also flexible payment options available for those who require it. Kids and parents are also welcome to sit in on rehearsals before committing to the CYO. “It’s a safe place, it’s a great place, there’s lots to learn, and there are lots of benefits. I think it’s a very reasonably priced form of educating your child to a variety of things and inspiring them,” says Louwersheimer. “They look like they’re having so much fun. What I like offering is the motivating aspect of it. Music is something to be shared, it’s not something to hold to yourself,” says Voth. The CYO’s Christmas Benefit Concert with dinner and silent auction takes place at Chilliwack United Church on Dec. 9. Dinner is at 6 p.m. and the concert is at 7:30 p.m. Tickets: (dinner and concert) $35/adult, $30/senior, $20 children 6-12, children five and under free; (concert only) $15/general, $10/seniors and children 6-12, children five and under free. Tickets available at King’s Music (45450 Luckakuck Way) starting mid-November. Proceeds go to Ruth and Naomi’s Mission. For more info, purchase tickets, donate auction items, or register your child with the CYO, contact them through their website at www.chilliwackyouthorchestra.com. Jenna Hauck/ The Progress The junior and intermediate members of the Chilliwack Youth Orchestra rehearse for their Dec. 9 benefit concert. Jenna Hauck/ The Progress The senior members of the Chilliwack Youth Orchestra rehearse for their Dec. 9 benefit concert. Jenna Hauck/ The Progress Johan Louwersheimer leads the senior members of the Chilliwack Youth Orchestra through rehearsal.